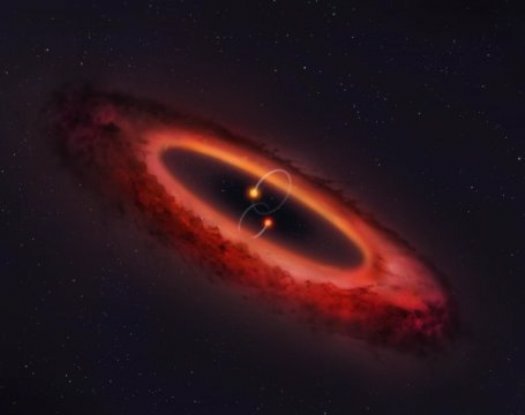 New research led by an astronomer at the University of Warwick has found the first confirmed example of a double star system that has flipped its surrounding disc to a position that leaps over the orbital plane of those stars. The international team of astronomers used the Atacama Large Millimeter/sub-millimeter Array (ALMA) to obtain high-resolution images of the Asteroid belt-sized disc. The overall system presents the unusual sight of a thick hoop of gas and dust circling at right angles to the binary star orbit. Until now this setup only existed in theorists’ minds, but the ALMA observation proves that polar discs of this type exist, and may even be relatively common. Dr Kennedy and his fellow researchers used ALMA to pin down the orientation of the ring of gas and dust in the system. The orbit of the binary was previously known, from observations that quantified how the stars move in relation to each other. By combining these two pieces of information they were able to establish that the dust ring was consistent with a perfectly polar orbit. This means that while the stellar orbits orbit each other in one plane, like two horses going around on a carousel, the disc surrounds these stars at right angles to their orbits, like a giant ferris wheel with the carousel at the centre. If there were a planet or planetoid present at the inner edge of the dust ring, the ring itself would appear from the surface as a broad band rising almost perpendicularly from the horizon. The polar configuration means that the stars would appear to move in and out of the disc plane, giving objects two shadows at times. Seasons on planets in such systems would also be different. On Earth they vary throughout the year as we orbit the Sun. A polar circumbinary planet would have seasons that also vary as different latitudes receive more or less illumination throughout the binary orbit. “We used to think other solar systems would form just like ours, with the planets all orbiting in the same direction around a single sun. But with the new images we see a swirling disc of gas and dust orbiting around two stars. It was quite surprising to also find that that disc orbits at right angles to the orbit of the two stars. “Incredibly, two more stars were seen orbiting that disc. So if planets were born here there would be four suns in the sky! The research is supported by the Monash Warwick Alliance, established by the University of Warwick and Monash University in 2012 as a bold and innovative project to develop an Alliance with a breadth, scale and impact beyond standard practice in the sector.